Discussion in 'Article Discussion' started by bit-tech, 5 Oct 2018. Users losing files on upgrade. The company skipped the Release Preview portion of its Windows Insider beta-testing programme, choosing instead to release the update to the general public without that additional phase of testing. On that note, have they pulled it, because I tried to update my laptop today and it couldn't find the 1809 build...? And this is not an Intel system. I don't mind updates, but at least give us the chance to opt out of the damned things! They do. They're user-exposed settings, with clear descriptions, and even in the shiny new Settings pane rather than needing to set a registry key or group policy. Not on a Home version of Windows, the version that most home users will be running and the less technically savvy will be on. 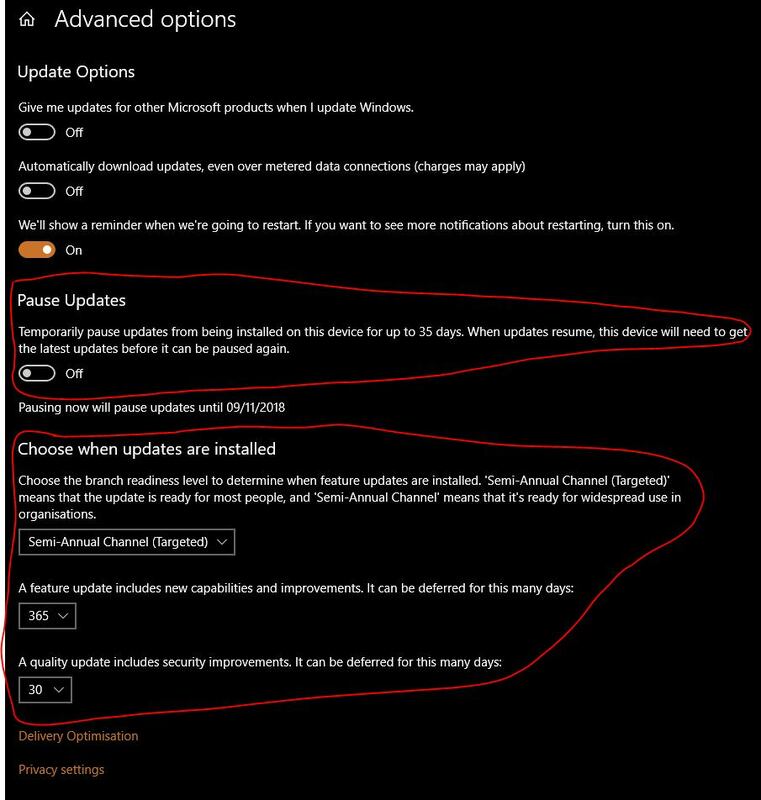 They can of course set the network to metered, tell windows not to download updates on a metered connection and pray it actually listens to the settings the user has set. Edit: A delay is also not an opt out. Weirdly I had that too. For the first day i had all kinds of connection issues. It went away though. Frankly i'm not liking how my PC is acting after the update. I'll wait a week or so and do a clean install with the updated media tool. On that note, have they pulled it, because I tried to update my laptop today and it couldn't find the 1809 build...?. Answering my own question; yes, Microsoft have officially pulled build 1809 due to this "bug" of files pulling disappearing acts. And now, Microsoft, do you understand why skipping testing is a very dumb idea? What utterly braindead incompetent decided that this early push to release was a good idea? Because you need to remove them from the process of making that decision. And now, Microsoft, do you understand why skipping testing is a very dumb idea? But it saves time. And money! Won't you think about the money?! I do think about the money! I think about the money I've spent on Windows and associated software (Office) and wonder, almost every time there is an update, whether someone at Microsoft is either a) having a laugh at customers expense, b) extracting dissolved urea, c) genuinely that incompetent or d) all of the above. It won't save time or money at all if this kind of thing keep happening and Microsoft get hit with a lawsuit. I wonder if "deleting my files just by updating" could be considered "unfit for purpose"? All I can say is. After installing it on two devices and one of them tanking completely. I'm glad it's been pulled. I wonder if "deleting my files just by updating" could be considered "unfit for purpose"? Is there not a caveat somewhere in there that says you may lose files though? Possibly in the fine print, but in the big "advertising" bits that play, I'm sure in the past Microsoft have said things like, "When you finish updating, all your files will still be right where you left them so you can get right back to work..." (or words to that effect...) I've not tested 1809 yet. Thank God. I'm sure it takes an immense amount of effort to create and update an OS but surely the first rule of updating is 'DO NOT DELETE ALL THE THINGS!'. adidan and edzieba like this.